Ohio State put together a complete team victory in defeating No. 1 Alabama in the Sugar Bowl. The Buckeyes beat the Crimson Tide by controlling third down on offense and defense, creating explosive edge plays, and corralling Armari Cooper. Now the Buckeyes must turn around and prepare to face the Oregon Ducks for the national championship. Cover 4 has become perhaps the most popular coverage in college football because of its versatility. Also known as quarters, the coverage can be used to aggressively apply both safeties against the run. But it alternatively can be deployed to limit easy throws and take away vertical routes. Ohio State defensive coordinator Chris Ash generally favors the latter. Rather than having run stoppers at safety he looks for rangy players that can constrict throwing lanes. So it should come as no surprise that Ash's philosophical framework was on display against Alabama. On early downs the Buckeyes operated almost exclusively from their 4-3 over, cover 4 press coverage framework. But rather than coming downhill against the run, the safeties were almost entirely divorced from the run game. Ash instead used coverage tags such as cloud that allowed the safeties to play deep halves. The purpose was to bracket Cooper. Ash did not have corner Doran Grant mirror Cooper because Cooper operates from so many positions. Instead, Grant played the boundary and Eli Apple to the field. The Buckeyes sought to use press corner coverage to take away screens and other underneath throws. And by bracketing Cooper their primary goal was limiting yards after catch and preventing explosive plays. The lack of secondary support left Ohio State somewhat vulnerable against the run -- particularly to the boundary away from walkout linebacker Darron Lee. 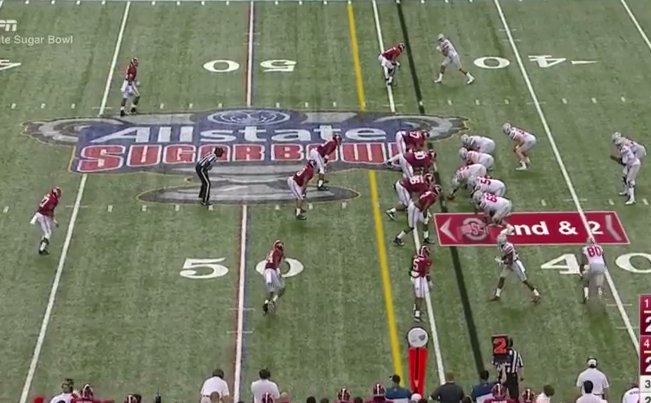 Alabama had early success running to the left side boundary away from Lee and Joey Bosa. 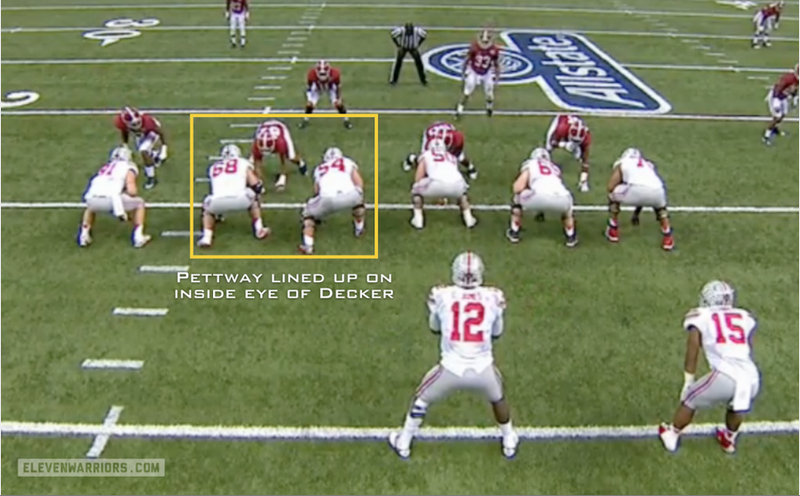 For instance below safety Tyvis Powell brackets Cooper inside, opening a running lane for Derrick Henry. The Crimson Tide also had success with an edge play they had rarely used -- power read. But the Buckeyes had enough success limiting the Alabama running game with interior penetration. Midway through the season the defensive staff placed Michael Bennett permanently at 3-technique, with Adolphus Washington playing the nose. That decision has paid off. Bennett repeatedly re-set the line of scrimmage, stopping the Alabama running game in the backfield. Ohio State also frequently slanted their defensive line in an attempt to get penetration against the run. Some have criticized Kiffin for not running the football with Henry more frequently against Ohio State. But the Buckeye defense had enough success stopping the run that the Alabama staff could not simply count on running the football every down. And the Alabama offense became particularly ineffective once they got behind schedule -- particularly on third down, where they only had a 15% conversion rate. Ash and Luke Fickell confused Sims with a mix of coverages and zone blitzes. Sims was either pressured or locked onto Cooper with limited success. In fact, Ash and Fickell used Sims' tendency to focus on Cooper to bait Sims' into Steve Miller's interception with a double-A gap, cover 2 zone blitz. At the snap, Doran Grant dropped off and remained outside. Sims thought he had an easy first down to Cooper. But Miller dropped underneath the throw, setting up his interception return. So Kiffin was forced to try and manufacture plays on first down to ensure second or third and short for fear of getting behind schedule. As importantly, the Buckeye secondary limited explosive pass plays until the game's waning minutes. Several times, Kiffin dialed up play action vertical routes from under center. Although Sims was able to scramble for positive yards, he was unable to deliver the football downfield. The Buckeyes also received critical contributions from an improved linebacker corps. Middle linebacker Curtis Grant has his best game as a Buckeye -- specifically doing a better job coming downhill against the run. Although Ohio State allowed 35 points, they undoubtedly put forth a stout defensive effort. Two of Alabama's touchdowns came off turnovers. And the Buckeyes forced five three and outs and three turnovers -- two of which came during the critical period when the Ohio State offense was stuck deep in its own territory. with a Bear front featuring a nose guard and two defensive tackles in 4i alignments. From the outset it was clear the Buckeye offensive game plan was to attack the edge of the Alabama defense. Ohio State frequently motioned their tight end and edge receiver to force Alabama to declare their coverage and move the Crimson Tide nickel defender. From there, the Buckeye offense featured three run plays. First, Urban Meyer and Tom Herman utilized sweep read. The center and/or playside guard pull (depending on the defensive alignment), while the quarterback reads an interior linemen. This allows the offense to not block an defensive tackle, allowing the offense to get numbers to the edge. Below, the Buckeyes put their trips to the boundary. This placed the Crimson Tide nickel force defender away from the field, opening the wide side for the play. Second, Ohio State used bash. Bash is a quarterback inside zone for the quarterback. The tailback runs a sweep away from the zone blocking, providing the defense a false key. The H-back and/or slot receiver then arc block the nickel and/or linebackers. Third, to open tight zone, Herman and Meyer generally paired the run with a fake jet sweep to hold the backside edge nickel defender. While the Alabama defense is very stout inside, they have been vulnerable horizontally. Ohio State was able to amplify this weakness by using one of its strengths -- its wide receiver blocking. And Ezekiel Elliott did a fantastic job by being patient in setting up his blocks, sticking his foot into the ground, and then accelerating. But the Buckeyes had to settle for early field goals as the passing game sputtered. Alabama -- cognizant of the fact that Ohio State hurt Michigan State and Wisconsin by throwing hitch routes early -- brought their corners into press coverage, taking away several quick throws. The Crimson Tide stuck often used their base zone coverages -- cover 3 rip/liz on early downs and cover 2 on third down. But defensive coordinator Kirby Smart did frequently bring a blitzer -- often from the edge -- as an additional defender against the read run game, while playing cover 1 man behind. And the Crimson Tide defensive tackles were also able to create some early interior pressure against the pass. But the Buckeye passing game began clicking once the Crimson Tide corners were forced to provide greater cushion after getting beat downfield. From there, Herman began utilizing inside breaking routes against Alabama's outside leverage. In particular, the Buckeyes used four and five wide sets to force Alabama to more quickly declare whether they were using one or two high safeties. Herman then exploited the Crimson Tide's preference for cover 2 in passing situations with crossing routes that vertically stretched the Alabama back seven. Ohio State utilized drive and follow shallow crossing routes that created a hi-lo on the Crimson Tide inside linebackers. And on third and long Herman dialed up two critical deep crossing routes to Jalin Marshall. The opposite side fly route pulled the deep safety over in support, opening the throw to Marshall underneath. With the middle of field threat established Cardale Jones was then able to hit Devin Smith vertically for a touchdown on the second half's opening drive. But up 34-28, the Buckeye offense suffered three straight three and outs. The primary culprit was field position. Alabama punter JK Scott may have been the Crimson Tide's most valuable player in the game, as he repeatedly pinned Ohio State inside the ten yard line. With this advantage, Smart became more aggressive, frequently dialing up his bear defense and edge blitzes. Ohio State tried to hit deep throws to escape, with limited success. But the Buckeyes ultimately broke through with a seldom used play -- a pin and pull outside zone to Elliott. Evan Spencer delivered a perfectly executed crack back block, freeing Elliott. For his part, Jones was streaky. Jones was inaccurate at times when his feet were not set. But when his footwork is correct his arm strength becomes a huge asset. It is not just that he can throw the football far. It is also that he delivers the football so quickly that defensive backs do not have time to break on the ball. As importantly, Jones created necessary explosive drives and crucial third down conversions with his legs. In the first half, those run came primarily on scrambles. But Jones also executed power read to perfection. Consequently, he showed the ability for the first time to gain difficult yards. But perhaps most critical was the blocking of the offensive line and receivers. Alabama won some plays. But Ohio State controlled the line of scrimmage across the width of field, showing the versatility to block inside or pull and lead on the edge. Likewise, using mostly slide protection, the offensive line, tight ends, and running backs mostly slowed the Alabama pass rush and provided Jones a clean pocket -- particularly in the second and third quarters. And like Spencer, wide receivers repeatedly cracked backed and sealed inside linebackers. In so doing, the Buckeyes wore down the Crimson Tide back seven. In particular, Alabama immediately missed safety Landon Collins both times he had to leave the field -- most notably on Elliott's 85 yard touchdown run. In sum, the Ohio State offense suffered from poor field position most of the game -- with an average starting position of their own 18 yard line. But the Buckeyes were largely able to overcome that field position by going 10/18 on third down and creating eight plays of 20 yards or more. The Buckeyes will obviously need another such performance in the national championship game next Monday against Oregon. I will preview the Ducks' offense and defense this weekend.